Everyone seems to have a wishlist on their blog. I love looking at them, and well, I do have a few wishes myself. My wishlist is quickly diminishing because the style I like is becoming more and more focussed. I used to want all the pretty things - now I just like a few things that suit my style. Let's get this show on the road! Click on the pictures to go to the websites! 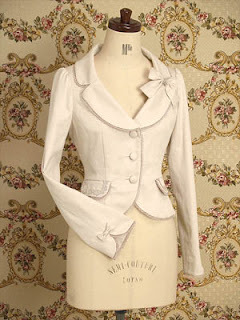 The number one thing that I want, the thing I'm pining for daily, is this cream coloured jacket from Mary Magdalene. Sometimes I check their website to see if they've re-released it, but never! They so rarely release anything. It never comes up on the sales community either. I guess I could post a Want To Buy! VM did a similar jacket but it's just not good enough!! 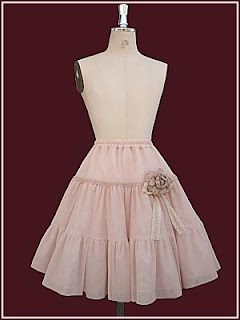 Next is a dress I tried on when I went to the Victorian Maiden Press Room in 2010, the Dorothy Doll Dress. I like this burgundy colour. 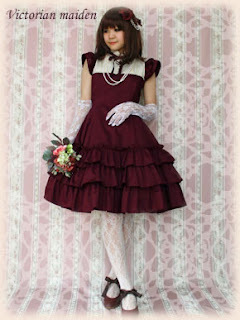 It has little frill sleeves and a collar part with detachable bow. The ruffles are full and glorious. 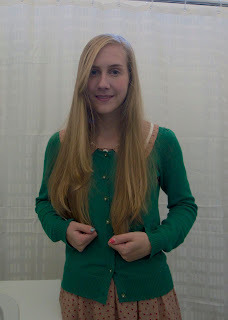 Looks lovely with or without a blouse underneath. This dress is also sold out. I have high hopes of them doing a re-release sometime in the future, because this was originally a Beth dress back in like 2008. 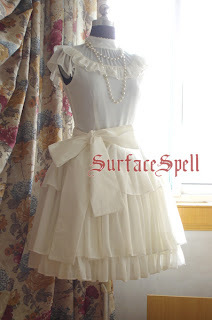 Next - a replica of a Victorian Maiden dress by Surface Spell - available through Qutieland. The reason why I haven't bought this one is that I don't know what colour would suit me. It's available in heaps of colours! I like the silhouette of this - it's not too puffy and you could wear it for a vintage look. This coat from Melche Shutilforc - a brand that I discovered for the first time a few weeks ago. I really like all of their stuff, but this coat looks really nice and warm. It's got lovely embroidery and a detachable fluffy collar. And pockets! I need pockets. 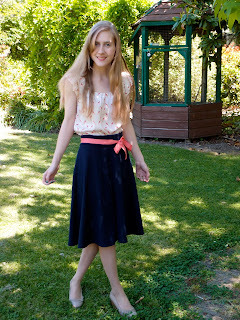 Also really like this skirt from Melche Shutilforc. I really like that brand now! It's really pretty and tasteful, falls nicely and isn't too fussy. That's all actually. No other wants! I expect this post will be added to periodically. If anyone has any of these things they'd like to sell me, my feedback is here! Lists are fun, aren't they? I like the Surface Spell one the best.